I am a bit confused. Your ticket status says that it was updated today. :/ To me it looks as if this case is still open, so I would appreciate if we kept it to tickets. Otherwise we cannot help you. Ranting on RMS about your ticket status does not change the speed we deal with your case. As for access to accounts, I can assure you that nobody has access to your accounts unless you use the exact same username and password on other websites or something. It's also not wrong for us to assume that you shared your login details because in 99% of all cases that's simply what happens. The last real hacking case we had (someone in a cyber cafe grabbing the username and password from a user through a keylogger) was years ago. So ya, should you be interested in resolving this issue then simply get back to us in the ticket. If not then not. Have a nice day! I hope you get a satisfaction outcome to your case based on what you said. I could understand the frustration, I don't see this as a rant but a share of experience as what the review section is for. 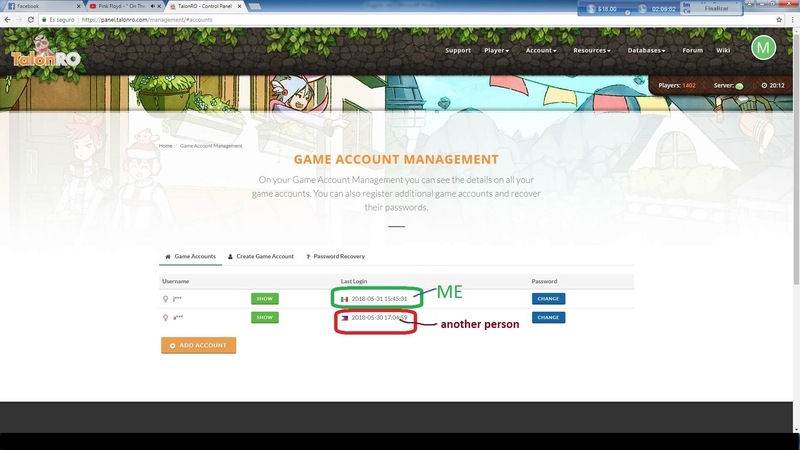 Yes it is very common for players to share account or use the same login details on every server, it adds extra work to GMs when that happens. Do keep in mind that many servers open and close every month/year and they do not keep your data safe. For example, try to put your login / password in Google search and see if it comes up in a pastebin or something. Ehm yes, but there is only so much the GMs can do. It's not our responsibility to make sure that players use a different password or don't share their login details. We always warn players and encourage them not to do that as we cannot offer much support when you willingly hand over your account details to a third-party. In this case for instance it turned out that the topic starter is sharing his accounts with at least two other persons and he got zero control over what they do with that information. my brother and my friend who played in vane ro, but there are only bots so we tried something more stable like talon ro, but they could not stand the low rate they stopped playing, they prefer to play lol, I just told my experience I did not speak badly about someone,only 2 ips be login my account me and the hacker. you can take the ip from philipines and kick him, i use ip static from mexico. I dont know what this is supposed to add to your case. It's still entirely possible that your brother or friend used a proxy /vpn and broke into your account. I am not saying that's what happened here, but over the last 12 years I have seen many disgusting things in support tickets. This wouldn't be the worst case. I have offered you to restore the items you lost already, the "hacker" is banned, so I don't know why this topic is still relevant. At the end of the day I recommend that you change your password and don't share it with your brother and friend, but I am pretty sure that nobody listens to what the GMs say anyway. We just gotta deal with the tickets and if we aren't fast enough then rant topics are opened on RMS. Thanks anyway!